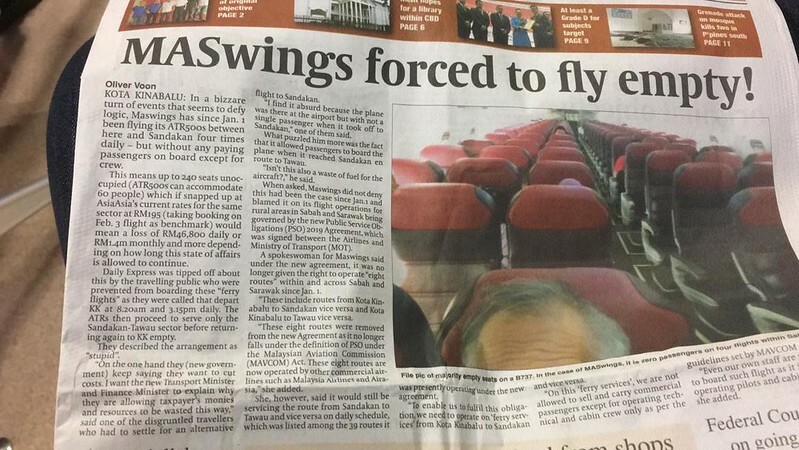 MASwings forced to fly empty! KOTA KINABALU: In a bizzareturn of events that seems to defy logic, Maswings has since Jan. 1 been flying its ATR500s between here and Sandakan four times daily – but without any paying passengers on board except for crew. This means up to 240 seats unoccupied (ATR500s can accommodate 60 people) which if snapped up at AsiaAsia’s current rates for the same sector at RM195 (taking booking on Feb. 3 flight as benchmark) would mean a loss of RM46,800 daily or RM1.4m monthly and more depending on how long this state of affairs is allowed to continue. Daily Express was tipped off about this by the travelling public who were prevented from boarding these “ferry flights” as they were called that depart KK at 8.20am and 3.15pm daily. The ATRs then proceed to serve only the Sandakan-Tawau sector before returning again to KK empty. They described the arrangement as “stupid”. Finally someone bring up the issue after nearly RM1.4m of losses (as the reporter estimation). Nonsense. That is an Airbus ATR500ER with Boeing Sky Interior. shall refer to the hard copy. there's a remark that the photo is taken from the B737 instead. as a reference to imagine how empty is the cabin is. I think there are also a number of MASwings Twin Otter positioning flights all this while - especially between MYY and BKI, but probably less glaring that this latest example. i think most of the major papers do make the same mistake, so doesn't need we enlarge the picture. in fact, the model is near to actual, just omitted the "72-". so far Twin Otter flight not affected from our observation. the routes from BKI to KUD-SDK, Lawas, Limbang still on. If there's demand for BKI-SDK flights at 8.15 am & 3.15 pm, then I'd agree that they were not smart to not pick up flying passengers. If there's no demand whatsoever, then why bother opening the flight up for passengers? from my previous experience the load is just nice for the flight. and my evening flight back from SDK is nearly full. The whole article is written poorly...like spoilt child yearning for attention. In fact, Daily Express's quality of reporting should be improved. Believe there is nothing to stop maswings to sell tickets on these reposition flight. For every $ collected is a $ less losses. Apparently there is - an agreement with the MoT. The spokesman told Daily Express that the new agreement also meant the airline was no longer afforded rights to operate eight specific routes across both Sabah and Sarawak. “These include routes from Kota Kinabalu to Sandakan vice versa and Kota Kinabalu to Tawau vice versa. “These eight routes were removed from the new agreement as it no longer falls under the definition of PSO under the Mavcom Act. “These eight routes are now operated by other commercial airlines such as Malaysia Airlines and Airasia,” the spokesman was quoted in the report. Edited by Mohd Suhaimi Fariz, 02 February 2019 - 02:41 PM. Since maswings has code share with MAB, can it wet lease to and operate on behalf of MAB on these forbidden sectors? That's a question better put to Mr. Loke. MASwings is a PSO carrier now, operating non-commercial basis except for BKI-LAC-BKI and TWU-TRK-TWU. Hence routes that they operate at the mercy of MAVCOM/MOT/CAAM. They are more of an entity created to service specific target of passengers where it is not commercially viable to ensure connectivity between those subsidized ports. Besides, AK have increased their frequency to SDK to cater the loss of capacity from MW's pullout. Infact capacity has grown between BKI-SDK, BKI-TWU and BKI-MYY served by other operators (including newly launched BKI-TWU by Malindo). Don't see any negative impact from this. Makes me wonder where was all those reporters when this decision was announced back in late 2018 . Everyone knew this would be coming. Maybe they could sell those seats on behalf of MH or AK. Really hate to see aircraft flying empty while spewing hydrocarbon into the atmosphere. Probably a dumb question, but could it be any more sensible to just base one ATR72 at SDK or TWU and have it fly to and fro those two places however many times a day as is necessary ? Based on the approved map. They could fly to lahad datu and onwards to tawau and sandakan from lahad datu...or is that also not approved by mot? i would suggest either BKI-LDU-SDK then continue to TWU or they propose new routes like MYY-TWU? Maswings don't really have the right equipment to compete on sectors head on with operators who fly jets. The aging ATRs are always plagued with technical defects and uncomfortable rides in not so nice weather. Especially in Borneo where the weather can be quite challenging. Its about time Maswings switch to regional/narrowbody jets in case they want to explore sectors beyond whats in their PSO agreement. Unlike FY who are have the Subang advantage, Maswings don't.